Fruit seasonality remains so far one of the priorities of agricultural research and development in the Democratic Republic of the Congo. However, due to the lack of reliable statistics and a schedule, it seems unappreciated and underestimated. This situation limits the prospect of fruit resource promotion and justifies the initiation of the current study of which the objective was to assess the biodiversity and fruit food value available according to the season in Kinshasa. The survey was carried out between January and June 2016 in the Lukunga district, particularly in Mont-Ngafula township where 100 vendors of fruits in selected markets of this township were interviewed. 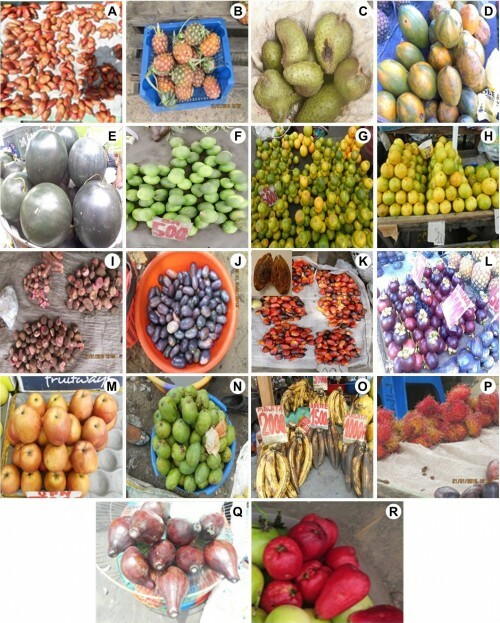 In the current survey, about twenty fruits sold on these markets were recorded and these fruits belong to 22 families dominated by Anacardiaceae and Rutaceae families. It was observed that the greater varieties of fruits were available in February than in June. It was noted that papaya, banana, coconut and apples were present from January to June while mangosteens, fewer passion fruits, rambutan and pink apples were only present in January and February. These findings showed that the sale of fruit is a very profitable activity. All these elements are important for they serve as the basis for the development of a research strategy for the promotion of fruit resources in DRC. Fig. : Some fruits found in four markets of Mont-Ngafula township, Kinshasa City.